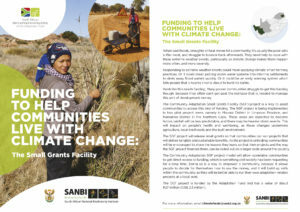 The project “Taking adaptation to the ground: A Small Grants Facility for enabling local level responses to climate change in South Africa” (US$2 442 682) will develop and implement a small grant finance mechanism in the context of climate finance, to deliver direct and tangible adaptation benefits with a view to scaling up and replicating this model. This project will be led by SouthSouthNorth and will be implemented in the Namakwa and Mopani Districts in Northern Cape and Limpopo Provinces respectively. The full project proposal submitted to and approved by the Adaptation Fund for the Small Grants Facility project is available here, and the supporting annex document here. When bad floods, droughts or heat waves hit a community, it Is usually the poor who suffer most, and struggle to bounce back afterwards. They need help to cope with these extreme weather events, particularly as climate change makes them occur more often, and more severely. Responding to extreme weather events could mean applying climate-smart farming practices. Or it could mean putting storm water systems into informal settlements to drain away flood waters quickly. Or it could be an early warning system which tells people that a nearby river is about to burst its banks. Work like this needs funding. Many poorer communities struggle to get this funding though, because they often can’t get past the red tape that is needed to manage this sort of development money. The Community Adaptation Small Grants Facility (SGF) project is a way to assist communities to access this kind of funding. The SGF project will be implemented in two pilot project areas, namely in Mopani District in Limpopo Province, and Namakwa District in the Northern Cape. These areas are expected to become hotter, rainfall will be less predictable, and there may be heavier storm events. This will impact on people’s health and well-being, as these changes undermine agriculture, local livelihoods and the built environment. The SGF project will release small grants so that communities can run projects that will deliver tangible and sustainable benefits. As projects unfold, communities will be encouraged to share the lessons they learn, so that their projects and the way the SGF project finances them, can be rolled out on a larger scale around the country. The Community Adaptation SGF project model will allow vulnerable communities to get direct access to funding, which is something civil society has been requesting for a long time. Doing so is a way to empower a community, because it allows people to decide for themselves how to use the money, and it will build up skills within the community so they will be better able to run their own adaptation-related projects at a local level. The SGF project has a value of about R27 m (US$2.5 m). SANBI Small Grants Facility Mid-Term Evaluation Report. The work of the NIE is informed by climate change projections that are derived from climate science studies. These include the studies that were undertaken as part of the Long Term Adaptation Scenarios process and downscaled projections for the Mopani and Namakwa District municipalities that were developed by the African Climate and Development Initiative.